I have never been an Irish teenage boy. Especially not one who idolizes pop musicians and desperately longs to be one in hopes of securing the attention and affection of a pretty girl so they can run off together to create a brighter future far away from parents on the brink of divorce. I have, though, been an American teen who idolized musicians and longed to be one — Barbra Streisand? Stevie Nicks? — in hopes of creating a brighter future far away from parents on the brink of divorce. Whether I secured the attention and affection of a cute guy or not. Which is why SING STREET resonated deeply with me. Why it made my heart sing. Writer and director John Carney (ONCE, BEGIN AGAIN) masterfully captured the intense feelings of adolescents — across the globe, throughout generations — who crave and voraciously consume music to assuage the angst and confusion of turbulent times, offer hope and something to believe in as well as someone to emulate until one's own identity can be comfortably embraced. SING STREET is a charming, poignant, and often laugh-out-loud amusing story set in 1980s Dublin, when MTV first debuted, Duran Duran rocked the radio, when everyone between the age of 13 and 30 dreamed of being a pop star. Fifteen-year-old Conor (Ferdio Walsh-Peelo) has learned the family's strained financial situation means he must leave his cushy private school and attend Synge Street. From the get-go, the all-boy public school seems rife with bullies — classmates and staff — intent on making his life miserable. Adding to the misery is the strife between his parents (Maria Doyle Kennedy and Aidan Gillen) and his lack of closeness with his older, seemingly wiser brother (Jack Reynor). Then he notices Raphina (Kelly Boynton), an alluring, equally angsty yet unbelievably beautiful girl who daily adorns the stairs across the street from the school. Conor is immediately smitten — and asks her to star in the video for his band. A band that doesn't exist... but soon does as Conor rounds up a rag-tag team of classmates equally hungry for video-star fashion, fame, and fandom. Every single person in the cast is spot-on perfect in his or her part. And hilarious in one way or another, some subtle, some slap-stick silly. Carney culled performances that touch viewers' hearts as well as their funny bones. The chemistry between Walsh-Peelo and Boynton encapsulates all that's awesome and awkward about first love. The wacky interactions between the boy-band buddies rocked real. The distance between the brothers — and their push-me/pull-me attempts to connect — was painfully accurate, the distress over dysfunctional families equally so. Like the acting performances, the music (and dance) performances were perfect. And often hilarious. One in particular, the scene/song in which Raphina stars in the band's first video, had me cracking up again and again, and giggling at how much it reminded me of the fabulously funny videos of Flight of the Conchords. (Oh, how I miss that show.) SING STREET has very much that same feel, same silly yet sweet sentiment. SING STREET can be categorized in multiple ways. It's a musical... sort of. It's a coming-of-age film... sort of. It's a love story, a buddy story, a comedy, a screwball silly sort of film. It's a film about dreams and never giving up hope on achieving them. Most of all, though, it's a film about the power of music in all its heart-shaking, life-changing glory — especially as it applies to adolescents who have yet to become cynical about such things. 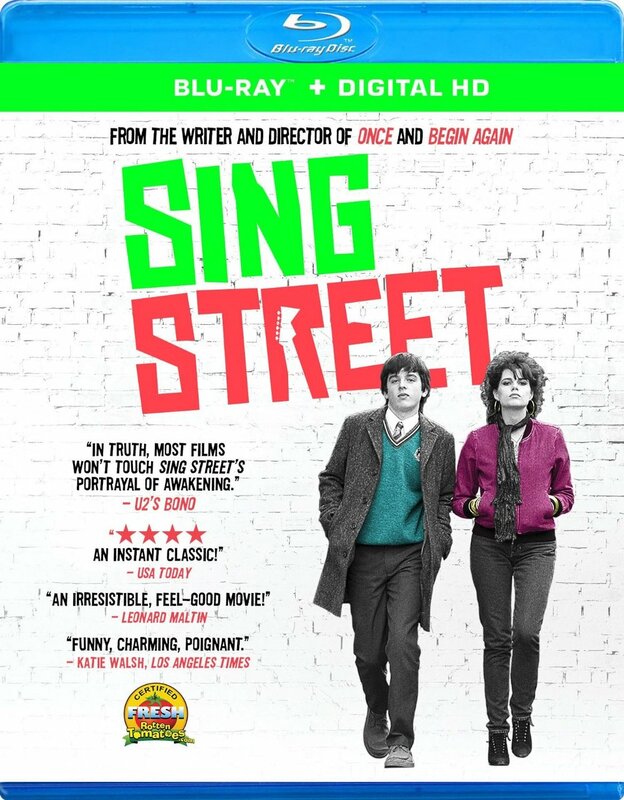 SING STREET (Rated PG-13 for thematic elements including strong language and some bullying behavior, a suggestive image, drug material and teen smoking) premiered at the 2016 Sundance Film Festival and is now available on DVD, Blu-ray, and streaming services.